Fun and Sun Without the Buns: Stress Be Gone! Okay, lately I have been extremely negative. About EVERYTHING! But guess what, it's a new month and it's never too late to change. Don't let your negativity rub off on somebody else, and don't let others' negativity rub off on you. This gross negativity was provided to me by the one and only, stress. Stress has definitely been bringing me down. I have been feeling like I want to give up. I have been cutting myself down a lot lately. I haven't been the funnest person to be around. Why does stress do this to me? Well for one, I let it happen. I put a lot of pressure on myself for no reason. I have been letting other things like my job take over my personal life. I've been feeling lonely. I have been questioning my blog even though it's something I seriously enjoy doing. I have been questioning my life! Ahh! And of course, I haven't been staying active or eating as well as I would like to be. Anyone else feeling as stressed as me? I sure do hope I'm not alone. If so, there is a solution… but you have to believe in yourself. Your whole self. Not that thought in your mind telling you that you don't have time for anything other than work or other "stuff". 1. 3/4 of the human population goes through stress. 2. Stress is the main factor of insomnia, or the lack of sleep. 3. Did you know that sugar can increase stress? Also, lots of caffeine, fast food, sodas, alcohol, even butter and cheese can increase stress too! 4. Stress can cause overeating. 5. Stress is interconnected with the most causes of deaths in the United States. But wait, it gets better! I promise! How can your healthy lifestyle kick stress to the curb? 1. Eating fresh fruits and veggies can reduce stress! 2. Water can definitely reduce stress. Also, soups and fish can help too. 3. Laughter is a natural remedy to get rid of stress. 4. Chewing gum (sugar free of course!) eases stress. 5. Do not skip meals. 6. Try not to eat just because you are stressed. Going for walk is a good stress reliever! 7. Supposedly, eating hard crunchy foods such as carrots or almonds can eliminate stress. I know there are a ton more ways to eliminate stress, but these stood out to me the most! 1. Stay motivated. Don't let the negativity take over. 2. Take more bubble baths. Yep. Relaxing. 3. Smile more! Smiles are contagious. 4. Don't get bummed about the little things. 5. Enjoy life. With others involved too. I don't know why I have let these negative feeling take over my body. I know I have a lot on my mind, but if I stay on track healthy wise (which honestly, I haven't been but that's okay!) then I know that I will have more positive vibes and energy! 1. Drink half of my body weight in ounces of water. 2. No sugar. EXCEPT natural sugars such as fruit (and some Kind bars). 4. Workout at least 3-4 times per week. 5. Make sure I try and eat smaller meals throughout the day. Okay, so please. Don't let stress get in the way of your life. Pray. Have alone time. Enjoy time with family and friends. Smile. Enjoy the life that God gave you. With all of that being said, it's time for a giveaway! This one is PERFECT for this post! 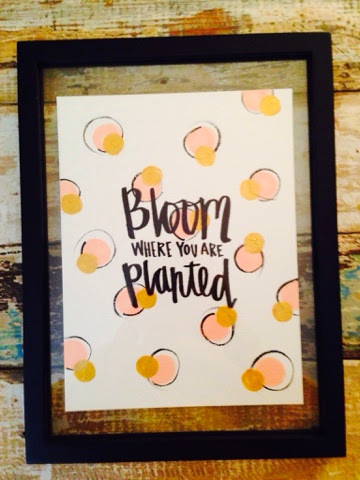 I have teamed up with Hannah from Hues of Grace, and I am giving away one of her amazing art pieces. This is an original copy and it was definitely painted with passion. Hannah is such a sweet and inspiring (literally) artist. She definitely makes everything with love and compassion! How can you win this piece? Well, be sure to look for a post on Instagram soon after this blog post. 1. You must follow @funandsunwithoutthebuns and @huesofgrace. 2. 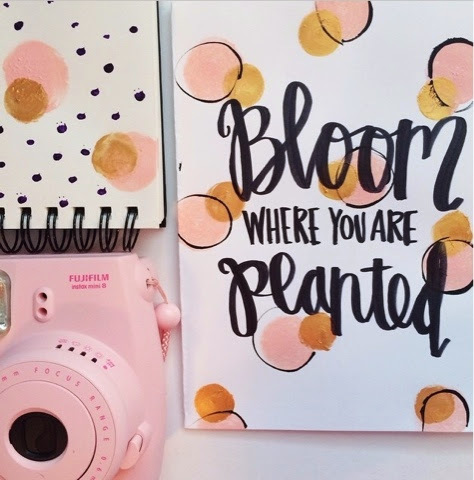 You must comment on my Instagram picture that I post with an answer to the following question, what does "bloom where you are planted" mean to you? This giveaway will end Sunday night (Monday 12 AM Central Time). What DOES this sweet message mean to you? To me, it means to live my life to its fullest. Live it freely, grow with love, and don't let others or other things bring me down.